I spent an afternoon at MITERS soldering connections and furiously zip-tying things together. Rather then buying a new controller and IMU, I borrowed the Arduino and wii sensors from tiny tricopter and loaded new firmware on it. The afternoon at MITERS evolved into a night at MITERS with debugging time factored in, then finally an early morning at MITERS when I managed to coax some magic smoke out of the arduino. Thankfully, I only fried one of the SMT caps for power regulation. I replaced it with a mylar cap and all was well. 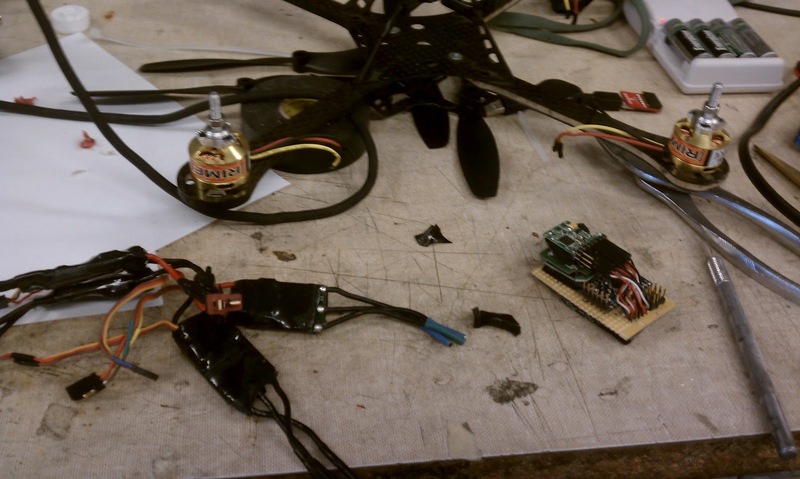 After finally getting the controller working, I started the tedious process of calibrating the ESCs. These speed controllers (Hacker X-20) are the first non-HK ESCs I've ever used. They're also the most annoying to calibrate. They do the usual thing when you start with high throttle - emitting a few beeps and squeaks before entering programming mode, but as soon as you've selected the first option you want to adjust, it quits! This annoying feature forces you to have to reenter programming mode multiple times, waiting through multiple minutes of beeps each time to tweak different settings. Multiply that by four, and you have a quadrotor. (another advantage of a tricopter: 25% less annoyance) Clearly I should start building my own ESCs like shane. It took a good dose of PID tweaking plus a few broken props to get it stable. It could still use some more help, but it's getting there. I even took some derpy upside-down aerial video in the courtyard. don't question it. If you watch the end, you'll see me herp derp it into a tree, then fall, and be caught by Aurimas. Nice catch. What camera did you use to record the video? Our team is building a quad for our college project .after online research we ordered componets from https://thehobbyshop.in/ based in pune, as it was near to our campus.Right now we are learning the code in matlab and simulating using SimuLink.we will start builing the project in 2 weeks .